Joan Marsh was daughter of the favorite cinematographer of silent film actress Mary Pickford. His name was Charles Rosher. Joan was born in Porterville, California and was only nine months old when she appeared in the Universal Pictures film 'Hearts Aflame'. After a number of baby roles Joan became a child star in Pickford films like 'Daddy Long Legs' and 'Pollyanna'. Her given name was Nancy Ann Rosher. 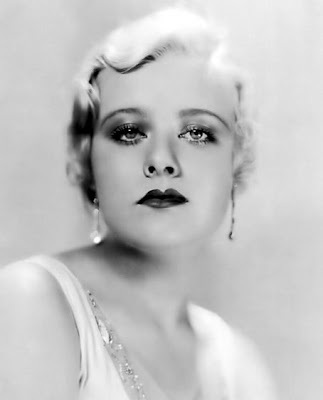 Early in her career she had used the name Dorothy Rosher for films like Hearts Aflame. Joan continued to do films until the early 40's. This image is my favorite of Joan, the pose, the art deco sculptures, but mostly that revealing two piece swimsuit. These images below were studio publicity portraits done in the 1930's. She possessed the talent of a fine comedian. However, with her figure, few noticed her acting ability. Even off-screen, walking across the studio lot to the cafe', Joan attracted considerable attention. It's easy to see why. they just don't make swimsuits how they used to!